I said this last year and it's still the same - Home Alone. I don't know what it is about that film but it always puts me in a Christmassy mood. It's a favourite from my childhood. If I'm looking for a more romantic film I'd watch The Holiday. Love that film! It would feel like cheating if we opened them on Christmas eve and I won't get home until 8pm as I'm working so there's never much time. We gather around the tree on Christmas morning, eating a tin of Quality Street or Roses and take it in turns to open our presents. My brother always gets up late because he's 27 and always a little hungover. This is a little bit sad but when I was about 8/9 I came downstairs at midnight because I thought I heard Santa coming. 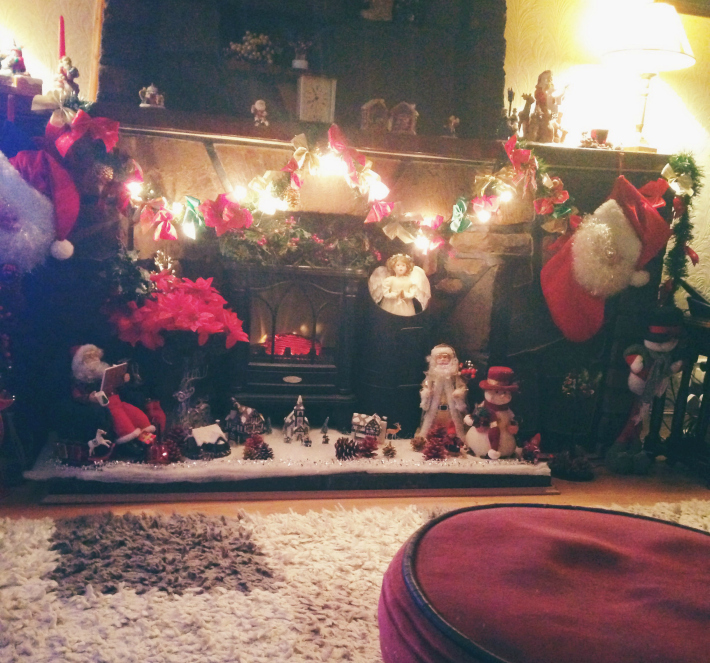 Instead, it was my mum still awake with a glass of wine, watching a Christmas film. She hadn't wrapped my Winnie the Pooh bear yet. Remember the massive bear everyone had? So I knew I had that to play with come Christmas morning. I don't remember sleeping much that night. This one is easy - turkey, pigs in blankets and chocolate. Bit of a mixed bag there. One of my favourite things about Christmas is sitting around the table with my family, eating Christmas dinner. It's the only time of year we sit around the table together. Probably the Winnie the Pooh bear I mentioned above. Or a tea set I received when I was about 6 years old. I knew I was getting it because I "accidentally" ripped open one of my presents, at least that's what I told my parents. Naughty! The smell of turkey as soon as I wake up on Christmas morning, cinnamon and the old, musty smell of the attic as my dad gets the Christmas decorations down. We have had an angel at the top for many, many years. She comes in a gold box and smells of cinnamon. I'm always the one to put her up on the tree. She has gold wings and wears a red and white dress. I don't know if I asked for anything too extravagant. I usually asked for a pet but with my allergies that was always a no-no. Remember kids, a dog is for life, not just for Christmas! Spending time with my family on Christmas day, eating a delicious dinner my mum has slaved over for hours, feeling so full that I'm about to burst, settling down to watch a film that one of us has received as a present and having a nap before watching the Christmassy shows. I love watching peoples' faces when they open presents I've bought for them. I much prefer giving because you can't beat the feeling of finding something you know someone will really love.